How Much does Dating Direct Cost? 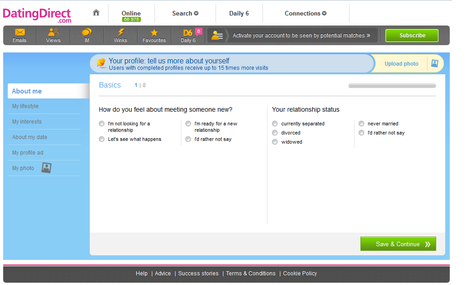 DatingDirect.com is part of the meetic network that powers the Match.com site, this means that you will be put in front of the same database of users as Match.com and so the pricing structure and some usability are similar to that of Match.com. 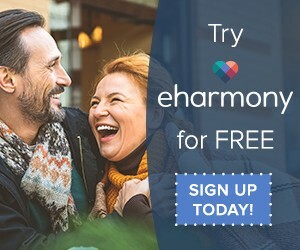 Because these 2 sites use the same base of users, you will be able to search over 5 million UK subscribers, so the chance of success is really high and again it is a fairly affordable dating site plus if you have already been a member of Match.com then you won’t need to spend any time setting up a new profile. 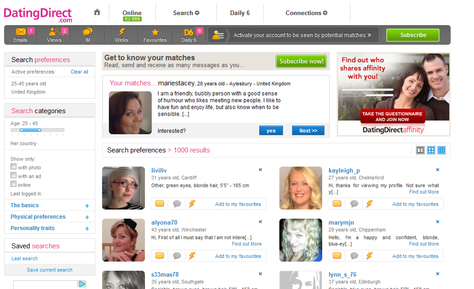 We will add any Match.com offers to this page because once you have a Dating Direct or Match.com membership, you can login to each site. How Much Does it Cost to Join Dating Direct? *Note – with Dating Direct’s 1 & 3 month membership, you must pay in a one off payment whereas their 6 month memberships have the option to be payable in 3 equal monthly payments. All memberships are auto renewed before they expire, so do yourself a favour and uncheck that box in your settings. 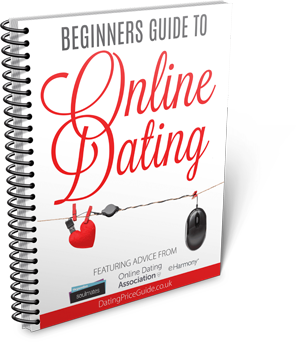 What Do You Get from Dating Direct For Free? If you have previously joined Match.com then you will skip the whole questionnaire stage, if not, it is very similar to the Match.com process. A nice feature of Dating Direct is their daily 6 section, they will send you 6 profiles a day based on your preferences and you simply need to give a yes or no, this will allow them to build the next 6 more to your liking. This process is great if you are short on time. Unlike some other sites, Dating Direct don’t shove the payment page in your face. You can also use the Dating Direct standard search to view profile pictures, who doesn’t love a browse through pictures you are matched with! 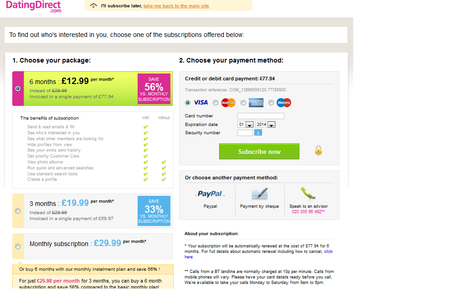 Here is the payment page, to find all of the payment options simply find the ‘click here’ link at the bottom of the page. This will highlight all the option for membership on the Dating Direct site. Much like Match.com we recommend you stick with the basic membership and skip the additional perks, at least to start. Our best offer for DatingDirect is our free £10 in cash when you sign up through DatingPriceGuide. 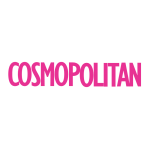 We will regularly update this page if we come across any great codes and discounts. *EXCLUSIVE OFFER* Join DatingDirect Today & I will send you £10 in Cash. your charges are way too high you need to reduce them!!!!!!!!!!! I am trying to join but your system will not accept my visa card. hi Gerald, you will need to go through to the actual site to join, give them an email if you are still having trouble, good luck ! Iiwish to rejoin again but you will not accept either of my bank cards, yet you are still showing my profile and I cannot answer messages sent to me. If I pay for only six months will my profile be automatically removed when I stop paying ? Nope, once you stop paying you will simply lose the features you paid for, your profile will still be there in case you want to become a paid member again. *Remember* to cancel the auto renew when you do sign up so you don’t pay more than what you thought you would!